Rancho Santa Fe, a suburb of San Diego and one of the most expensive places in the country, is picturesque, strewn with golf courses, luxury retailers, and sports cars. However, in 1997, the world learned that Rancho Santa Fe was home to Heaven’s Gate, an American UFO religious millenarian cult. Led by Marshall Applewhite and Bonnie Nettles, the cult believed that planet Earth was to be “recycled, wiped clean, renewed, refurbished, and rejuvenated” upon the passing of the Hale Bopp comet. The only chance to survive was to leave it immediately. While the group was against suicide, they defined it in their own context; to the members of Heaven’s Gate, suicide was to turn against the Next Level–in essence, to remain on Earth as the comet passed. Their solution was to commit mass suicide. Members of Heaven’s Gate believed that evil space aliens, called Luciferians, falsely represented themselves to Earthlings as “God” and conspired to keep humans from developing. Physical pickup into the Next Level, which also provided escape from the Luciferians, was only possible through rapture, which would occur when the comet passed. On March 19th, Marshall Applewhite taped himself speaking of mass suicide, asserting that it was the only way to evacuate the Earth. He persuaded 38 followers to commit suicide so that their souls could board the craft he claimed to be passing Earth with the comet. The group rented a 9,200-square-foot mansion, located near 18341 Colina Norte in a gated community for $7,000 in cash. All members, including Applewhite, were found dead in the home on March 26th, 1997. 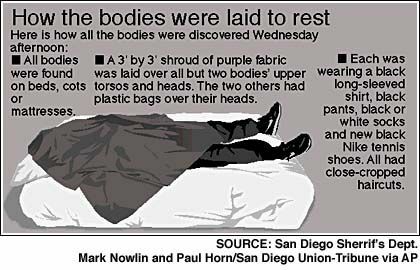 The bodies were found dressed in black sweatshirts and sweatpants, Nike sneakers, and their faces covered with purple cloth. Each person was carrying $5.75 in one pocket—people suspect this was to be used as some type of tole fee. Members had taken shifts, serving vodka and phenobarbital cocktails and tying plastic bags over fellow members’ heads before submitting to the ritual themselves. Years after the deaths, the mansion was torn down after the structure became a macabre tourist attraction. The still-vacant lot continues to be a popular tourist site, and people report having strange and eerie feelings when visiting the property. The street name has been changed, and there is no plan for development in the area despite Rancho Santa Fe’s prime real estate.